I don't remember anymore when I made this , what I know is it was made for a party, it could have been a birthday party as when it is a B'day party I go the whole way, make dishes which are very special ( the ones you usually don't make) . So ofcourse I would have decided what I am going to make for the party atleast a week before and as always I am excited when I make dishes which I have never tried. This is what Michel Roux had written about this dish, "This simple, tasty mousee is ustic yet sophisticated - a real gourment dish. I served them as a starter. First make the white roux. Melt the butter in a heavy pan. Off the heat add the flour and stir in with a whisk. Return to a madium heat and cook for 3 minutes, stirring continuously. Pour the cold chicken stock on to the roux, stirring all the time, then cook the sauce over a low heat for about 30 minutes, stirring occasionaly with a whisk. Season with pepper and salt to taste. Using you fingertips, rub the peppers very lightly with oil. Grill them ( I did in the oven) untill the skins are blistered and backened. Halve the peppers, remove the core and scrape out the seeds and white membrane. Dice the peppers finley as possible and you can keep few slices in long strips if you like . Add the shallots , thyme and basil to a bowl with the peppers , season with salt and pepper and stir in the oilive oil and lemon juice. Mix carefully, taste and adjust the seasoning. You can serve this salsa immedietly or cover with cling film and keep in the fridge for upto 48 hours? If you have left over salsa you can use them with pasta too. Soften the gelatine leaves in cold water . Slowly heat the veloute sauce untill it just reaches simmer, then take the pan off the heat. Throughly drain the gelatine leaves and add them to the sauce, together with the paprike. Whisk trhoughlyuntill the gelating has melted. Leave to cool at room temperature, stirring with a whisk time to time. Whip the cream to a ribbon consistancy. Put the dices ham into a food processor and whiz for 1 minuten then add the veloute and process for 2 to 3 minutes to make a smooth paste. Gently foild the whipped cream into the mixture, with a spatual. Scrape the mousse into a dish, cover the surface with cling film to prevent oxidation, then refrigirate. Take the Ham mousse out of the fridge 20 minutes before serving. Peal the ends of the asperagus spears, halve lengthways and blanch lightly, drain throughly. Dress the radicchion simply with few drops of lemon juice. Shape the mousse into quenelles ( I did ball using a ice cream scoper), allowing 1 to 2 quenelles per person and place on a serving plate. Arrange the radicchio leaves, asperagus on the plates. 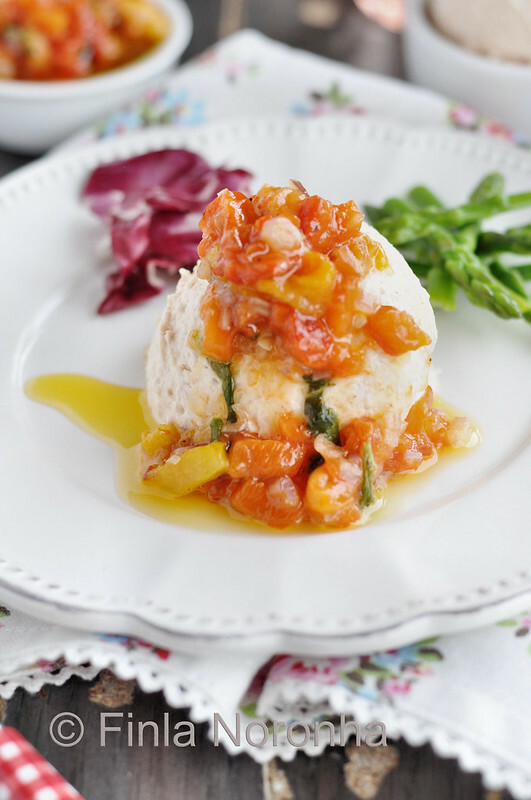 Spoon a little red pepper salsa over the ham mousse and serve with toasted bread slices. wow...ham with salsa with Indian touch ...u r rocking!! A beautiful savoury mousse, Finla. Love how you present it and the pepper salsa looks terrific. Hans birthday party, Finla!! Thats when you made it! Along with seafood in veloute sauce! Im still waiting for that recipe!! Hans birthday party! Thats when you made it Ginla. Along with seafood with veloute sauce. Still waiting for that recipe!! 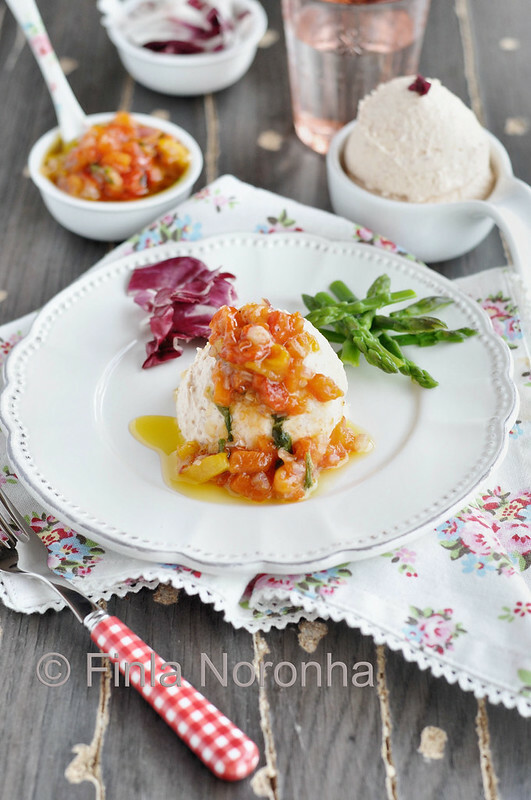 Ham mousse sounds seriously fabulous and am in love with that salsa.. The salsa sounds amazing with all those sparkling flavors in there, and that color! Finla, you made this mousse for Hans birthday party!! I remember very clearly your menu. This mousse, fish with veloute sauce, poached pears with an icecream and one more dessert. I am waiting very patiently for the fish recipe you made that day because it looked really good. Cham happy to hear you are doing good. Anna your memory is more sharper than me :-) I don't have a good pic of the fish dish, next time when i make them i will take a good pic and then add the recipe in the blog.